We also have a proven method for how we work with our clients. How would you feel if IT was no longer an issue for your business? Pretty freeing, right? 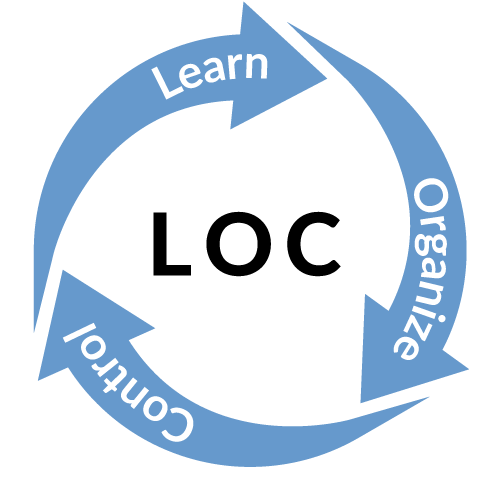 The good news is that out circular IT process – LOC Learn Organize Control® — helps make that dream a reality. LOC Learn Organize Control® helps you get the best user support experience possible, manage security risks and keeps your systems running at top performance. Here’s how it works. Sora Technologies starts by learning about your environment. We organize that information and identify any problem areas or potential ideas for improvements. Then we use that information to guide and control your IT solutions. Take a look at the 4-phase IT management and support functions we utilize in LOC Learn Organize Control to get an even better idea of how we will work for you. The first thing Sora does when we take over a new network is execute a series of steps (this takes a few months) to gather and document information, stabilize the network and resolve any immediate issues. We also use this time to look at each workstation, all servers and every component of your network. Everything we find is documented and securely stored in our internal database – making it readily available to all Sora staff involved in managing your network. Sora is constantly connected to your network – monitoring servers, workstations, network performance, and other key network components. We manage all updates, patching, security, spam and antivirus programs, making sure that you’re running as close to 100% uptime as possible. When issues do come up, Sora deploys the tools, resources, and people necessary to minimize downtime. Not only do we have someone on call 24/7 (that gets alerts to any issues with your system), we can make immediate remote connections to servers, workstations, and network components. If necessary, we’ll even come to your office to get the job done quickly. Our aim is to prevent (but also resolve) your IT issues. Once your network is documented and stabilized, Sora begins the process of seeking out and analyzing opportunities to reduce costs by generating improvements in network speed, efficiency, simplicity, functionality, and accessibility. We meet with your business as often as needed to keep you in the loop on all opportunities for improvement.